One issue with that process is that the metal atoms are usually different sizes or shapes from the atoms in the semiconductor materials that they're bonding to. As a result, the layers cannot form perfect one-to-one atomic connections, which is why small gaps or defects occur. "It is like trying to fit one layer of Lego brand blocks onto those of a competitor brand," Huang said. "You can force the two different blocks together, but the fit will not be perfect. 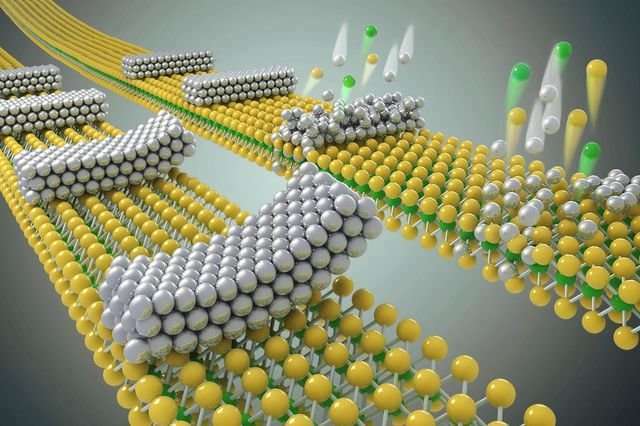 With semiconductors, those imperfect chemical bonds lead to gaps where the two layers join, and those gaps could extend as defects beyond the interface and into the materials." The UCLA method prevents the defects from forming, by joining a thin sheet of metal atop the semiconductor layer through a simple lamination process. And instead of using chemical bonds to hold the two components together, the new procedure uses van der Waals forces—weak electrostatic connections that are activated when atoms are very close to each other—to keep the molecules "attached" to each other. Van der Waals forces are weaker than chemical bonds, but they're strong enough to hold the materials together because of how thin they are—each layer is around 10 nanometers thick or less. "Even though they are different in their geometry, the two layers join without defects and stay in place due to the van der Waals forces," Huang said. The UCLA team is the first to verify the theory in experiments with different combinations of metals and semiconductors. Because the electrons didn't have to overcome the usual defects, they were able to travel with the minimum amount of energy predicted by the Schottky-Mott rule. "Our study for the first time validates these fundamental limits of metal–semiconductor interfaces," Duan said. "It shows a new way to integrate metals onto other surfaces without introducing defects. Broadly, this can be applied to the fabrication of any delicate material with interfaces that were previously plagued by defects." The paper's other UCLA authors are graduate students Jian Guo, Enbo Zhu and Sung-Joon Lee, and postdoctoral scholar Mengning Ding. Researchers from Hunan University, China; King Saud University, Saudia Arabia; and Northrop Grumman Corporation also contributed to the study. The study builds off of nearly a decade of work by Duan and Huang on using van der Waals forces to integrate materials. A study they led, published in Nature in March 2018, described their use of van der Waals forces to create a new class of 2-D materials called monolayer atomic crystal molecular superlattices. In an earlier study, which was published in Nature in 2010, they described their use of van der Waals forces to build high-speed transistors using graphene.